Hey gang! With Daylight Savings around the corner, it’s still feeling a bit like winter for us north-easterners. Mother nature has decided to bless us with more snow, and lots of it. For those of you who like to stay curled up by the fire, this might be your last stretch of cold weather (enjoy), and for others this means some excellent skiing ahead, and to that we say – stay shreddy winter bunnies! 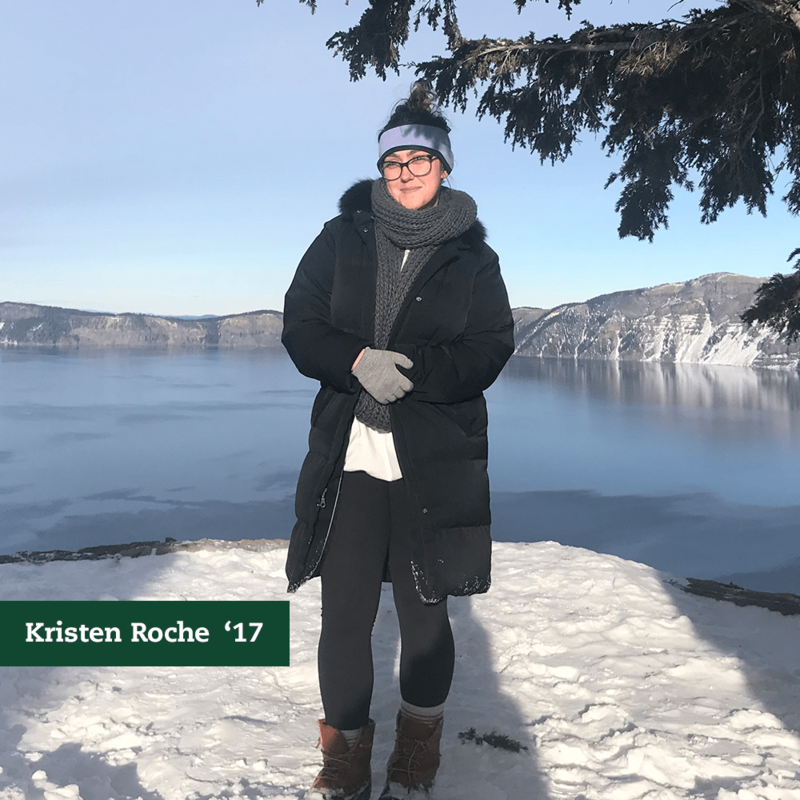 If you are looking for some UVM entertainment in this long lasting winter, Vermont Quarterly (VQ) published a new edition and we wanted to highlight some of the features. Hopefully, it is sitting in your mailbox right now, ready to be read. Here’s some background on your alumni magazine, a quick interview with the VQ editor, and highlights from the most recent publication. Vermont Quarterly has been around since 1905 (known back then as Alumni Notes) featuring various articles and stories focused on the university, alums, student life and much more. VQ’s goal is to keep alums like you engaged with the UVM community after you’ve parted ways. VQ offers a broader selection of stories than here on Afterword since it covers a little bit of EVERYTHING. We highly suggest giving it a peek even if you aren’t a heavy reader, it will keep you up to date on all things UVM – plus there are a lot of great photos. If you haven’t received the latest edition (or if it went to your parents), that means we don’t have your updated address. You can update that right here and you will be sure to get the next edition. 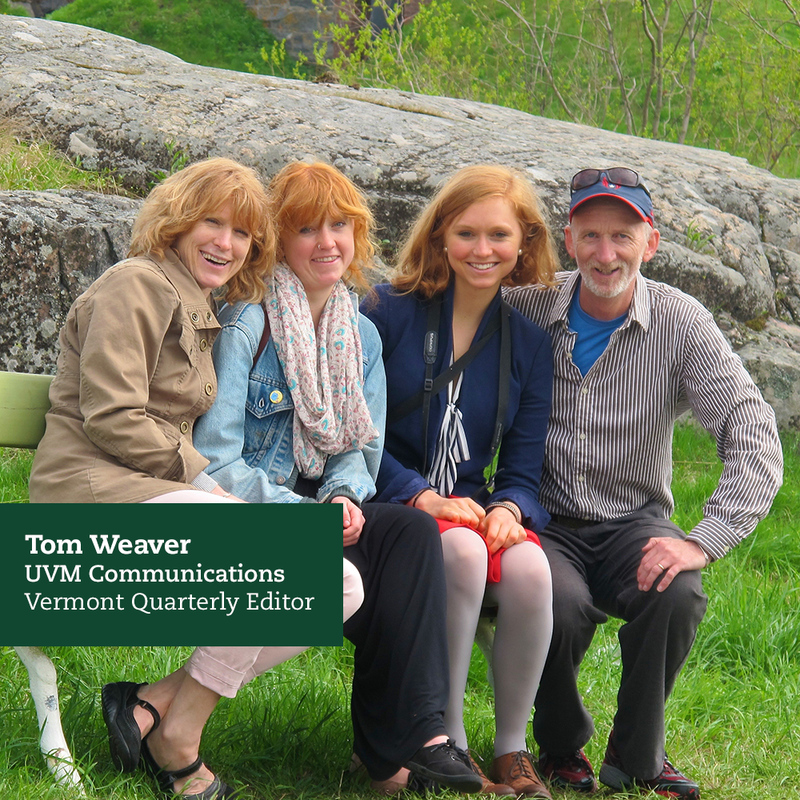 We had the chance to ask a couple questions to Tom Weaver, the current editor of Vermont Quarterly, for a behind the scenes look at its production. Tom on the right with his two daughters, Arline’14 and Grace’11, both UVM alums and wife Shelia, a senior lecturer in statistics at UVM. Well, though I’ve been here a long time, I actually wasn’t here in 1905. I think, generally, Vermont Quarterly, the other publications before, and these sorts of communications throughout higher-education were created as a way to keep alumni connected with one another and with their alma mater. I think one of our primary goals is reminding alumni of the institution they knew and keeping them abreast and proud of the institution we have become. Many good things, we hope, would flow from that — financial support to the institution, sending alumni kids and/or their friends to UVM for school, and pride that builds our reputation by word-of-mouth. How are the stories curated and picked? We draw ideas from many sources — news that is generated by writers in our office, stories we see in other publications or social media, stories we’re alerted to by alumni themselves or their family, friends, or public relations folks. Can anyone submit a story or feature? It’s rare that someone would send us a completed story for publication. More commonly, people suggest an idea we might want to pursue. Yes, ideas are welcome and best communicated through an email to me. Last summer’s fire at Torrey Hall threatened natural collections deeply ingrained in UVM history and vitally necessary to contemporary research. Helping bring the liberal arts to the incarcerated in Vermont is the latest focus for sociologist Kathy Fox in an academic career rooted in creating positive change. San Francisco and Burlington share a common spirit, part of the draw for the many alumni who have made their lives and careers in the City by the Bay. Business alumni help the next generation build experience and connections through the rigors of BSAD 228, Wall Street Seminar. If you’re interested in seeing more of what is inside this edition of VQ head over to their website. Until next time, stay warm my friends! Remember how we said we’d be calling you? Well, we collected all your answers, and have some fun facts for you all! All of you are amazing, but we know that being out in the world after graduation isn’t always the easiest. 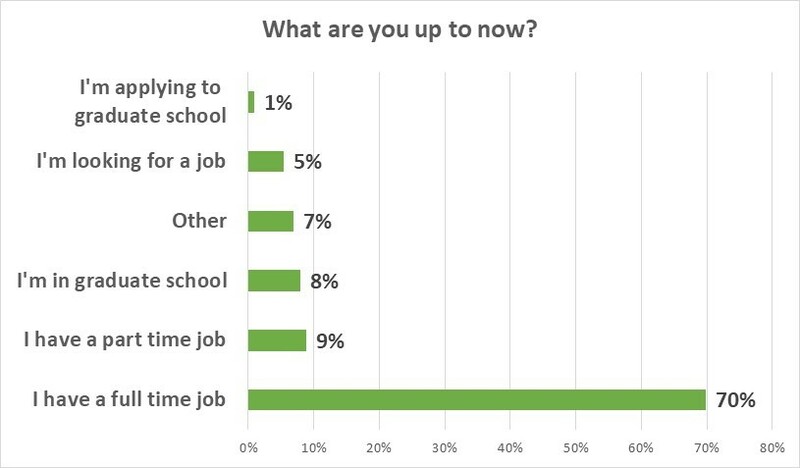 Part of the reason we do these check in surveys is to share with your classmates that their experience is not out of the ordinary – You’re not the only one working part time, or applying for grad school. We’re all finding our way together. Check it out! We have a sweet heat map of all the places that you guys have spread to since leaving campus, as well as some charts about what you’re all up to these days. Not shown here are the alums that are currently based in Canada, China, El Salvador, France, Indonesia, the Netherlands, Nigeria, Peru, Switzerland, and the UK! You aren’t just all over the country, you’re all over the world! 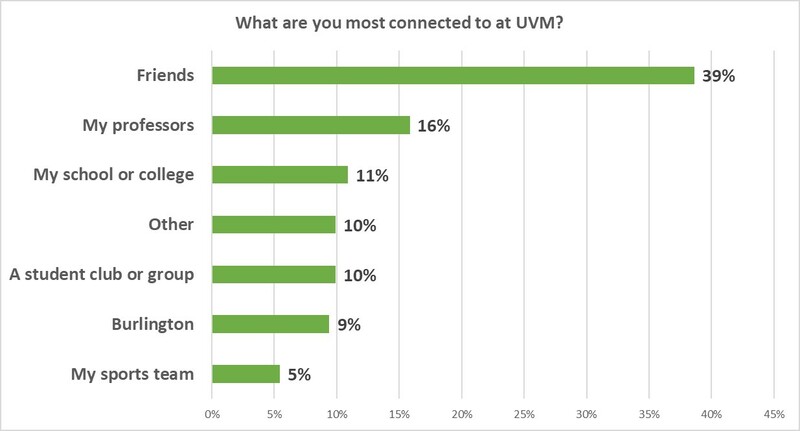 We also asked about what you guys feel most connected to here at UVM. We are always curious about this. With older alumni the answers are sometimes easier, because UVM was a smaller, different University. Now, with such a wide range of student experience, we want to know what you all identify with, and let that inform how we keep you connected with each other and campus. Thanks for all your input, we’ll be back next week with more classic Afterword. Over the past two weeks, the UVM Alumni Association hosted networking events in cities all over the country, including Boston, NYC, and San Francisco! If you couldn’t attend or don’t live in one of those areas, fear not. 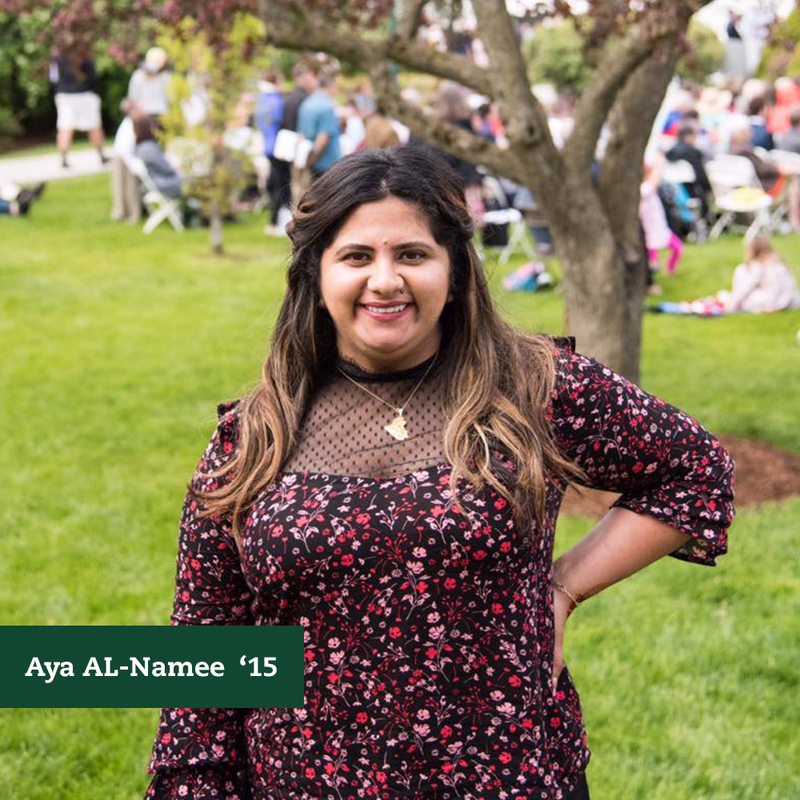 We checked in with Aya AL-Namee ’15, who attended the networking event in Boston, and are bringing her advice to you! As someone who’s worked in admissions, and a frequent Alumni volunteer, she’s a pro at the most effective networking approaches. Check out her advice below. What advice do you have for recent graduates attending networking events? My advice is to not be shy and to put yourself out there. Approach every interaction as a learning opportunity and a chance to ask for advice and you will get much more than what you expect from the networkers. Do not limit yourself to your industry! You will be amazed at what you can learn from other people who have experience in different professional fields. Did you have an outstanding interaction with someone at the networking event? Why was it memorable? I had many outstanding interactions and my most memorable one was with a business student who fearlessly approached the education and non-profit table and asked for general job searching advice – Should I go to grad school? Should I get a job right after? What was even more impressive is the fact that she added me on LinkedIn before any of the students who were interested in working in my field! Any other advice related to networking and job searching for recent UVM alumni? 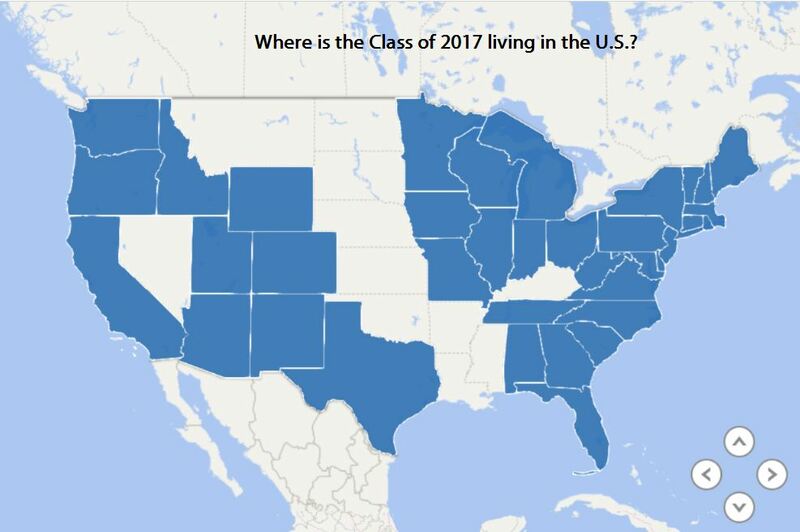 If you are a recent UVM grad, I highly recommend getting in touch with as many UVM alumni in your area as possible! You never know what that can lead you to. At the very least they will be a great group of friends and support system for you in your “real world” first steps. Yep. It’s finally arrived. For many of you, your first loan payment is this month. We get it. Even though it has been in the back of your mind for a while now, it still feels like a surprise. In fact, as an added bonus we are marking this occasion with a special giveaway: A free UVM Alumni Association bottle opener! You’ve earned it! Read on below for some helpful tips for making your first payment. With this in mind, here are five essential things you should do before making your first payment – because Afterword has your back. Read this article to get started understanding your loans. Get Organized. Figure out if you have federal loans or private loans (or both) and how many. It’s probably easiest to ask your parents, look at old mail, or check your email — you loan provider has almost certainly tried to contact you by now. Pick a repayment plan. There are several types and many loans have an option for income-based repayment. Also, if you are in grad school, make sure to defer your loans. Don’t make your payment late. They are already going to get enough of your money. Don’t give them any extra. 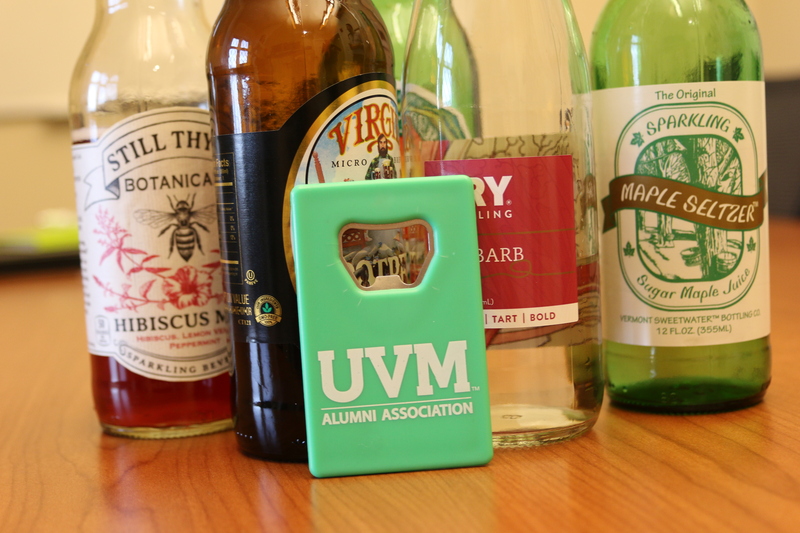 Get Your Free UVM Alumni Association Bottle Opener. Open your favorite Vermont beverage with it, sink into your couch, and start a Netflix binge. You earned it. (We personally chose some favorite maple and rhubarb seltzer).